It has been one year since I purchased the hot tub that CHANGED MY LIFE. But, I had dreamed of hot tubs for years. So, we bought it and restored it and now we’ve had it for one year. What about the warnings and the naysayers? Well, they were all ABSOLUTELY RIGHT. Our electrical bill doubled, and in one month, even quadrupled what it had been the previous year. Our hot tub broke six times in four months and was out of commission for weeks each time. In the hottest heat of the Indian Summer, we didn’t even crack the cover. And what no one had warned us about was that our water bill went up too – especially when the pump rotated backwards and drained the hot tub, TWICE. In spite of the cost, the hassle, and the heartbreak — there is nothing like getting all ready for a nice, toasty dip and opening the cover to find a cold tub with an error code on the control panel — this has still been one of the best purchases of my life. Much of the research for “Chance of Happiness” was done earlier this year when I bought a 15-year-old hot tub off someone’s back porch. This hot tub has changed my life. First, almost everything in “Chance of Happiness” related to fixing up the hot tub actually happened to us. We found a deer leg under the shell. (HOW???) The tub was most likely filled with antifreeze, which we bailed, thus causing the acrylic siding to crack. We nearly lost the moving trailer and the moving truck to a muddy field with a steep incline. My last naive thoughts about how easy it would be to transfer power died when the more experienced member of the moving party got out a multimeter and an axe. Once we got it home and into the backyard – a task that involved breaking at least one city ordinance – we had to rewire the house for the new electric load. The hot tub board was fried; we bought a new board and that broke, then received a replacement, which broke again — twice. One day we came home and found the hot tub half drained because the rebuilt motor had run backwards. This feat our 63-year-old hot tub mechanic had only ever seen one other time. Our electric bill doubled; our water bill doubled; we paid four months’ worth of bills in that one month of service. And we still hadn’t even gotten to try it! When I was telling everyone about my amazing restoration project, several coworkers confessed to having given up and gotten rid of their hot tubs. They were expensive, too much work, and never used much. But having a hot tub was my dream. 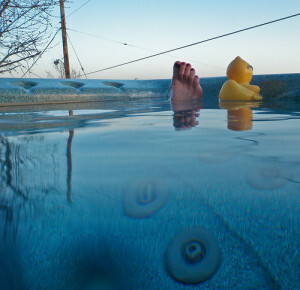 A bubbling blue hot tub was what rich people had, like fast cars and personal chefs and maid service. I was so shocked to discover that I didn’t have to save up $10,000 to buy a gleaming model like at the showrooms. The restoration was not cheap or easy, but my dream was so achievable. What had I been waiting for all these years? Six months after the first purchase, the Perseid meteor shower came to earth. With my loved ones, together, staring up at the vast starry sky.